Yes, it’s possible to do that – millions of people are doing it all over the world. It takes a bit of work but you can truly make Japanese progress alone. I trust you, you’re smart if you’re that self-motivated. 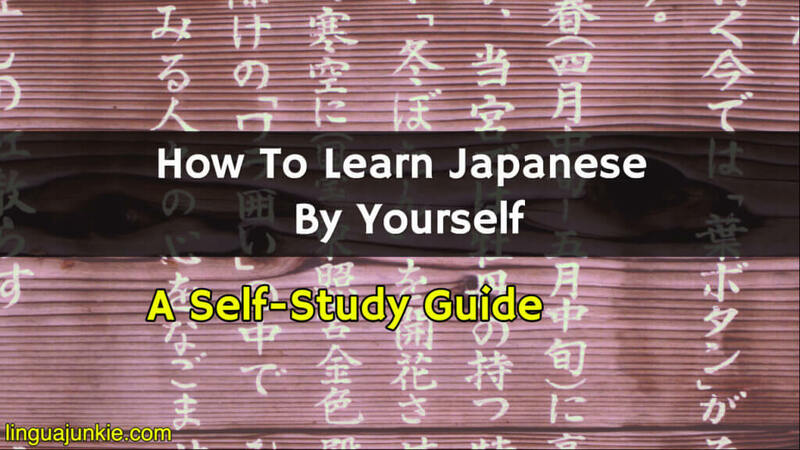 So, here’s a how-to guide on how to self learn Japanese. 8-Step Guide on Learning By Yourself. 1 Step 1: Learning Japanese Alone. 2 Step 2: What is your reason for learning Japanese? 3 Step 3: Remember, consistency is important. 4 Step 4: When is the Best Time to Start Learning Japanese? 5 Step 5: How Much Japanese Should You Learn a Day? 6 Step 6: Set A Small & Easy Goal Every Month. 8 Step 8: What Next? Stay Focused & Finish. Step 1: Learning Japanese Alone. Everyone wants to what resources they should get. They want to know what steps they need to take right now. Here you go. The Alphabet (Hiragana and Katakana). Honestly, you can learn this all online for free. Forget about kanji until you have these mastered. Or you can get yourself a beginner Japanese textbook to make life easier. (Keep reading for info about textbooks). Learn Hiragana first and then Katakana. Hiragana is one of three Japanese alphabets. How many Hiragana are there? There are 46 letters/characters in total. Katakana is the second kind of alphabet; it has 46 characters and the same sounds as Hiragana. It just looks different. So why do you need Katakana? The Japanese use Katakana for scientific terms and foreign words that have been adopted into Japanese ( coffee: コーヒー, koohii ). So, that’s why you need to know it. No other reason. Here, I have my own guide to learning Hiragana and Katakana. When will you learn Kanji? Learn Kanji after you’re done with Hiragana and Katakana. You’ll learn it along the way with whatever textbook you go with so don’t worry too much. 1) Japanese writing has no spaces so imagine reading everything like this – canyoureadthisisitfunforyoudoyoulikeityousickpervert? So, Kanji makes reading faster. With Hiragana alone, you’d have a hard time reading, telling the context and knowing where one word starts and the other ends. 2) There are tons of words that have the same spelling in Japanese. So, if we went with Hiragana, how would you tell the difference? You couldn’t. Kanji though has different symbols and that’s how you know which word is which. EVERY Japanese learner wants to speak and understand Japanese well. As a self-learner, there’s nothing better than Audio Lessons & Video Lessons – where you can hear, learn and master actual Japanese conversation. You can re-listen as much as you want until you get better. Look for Online Japanese Courses that specialize in this. My suggestion is JapanesePod101.com. You get tons of lessons that get you speaking from Beginner Level and work your way up. Great way to learn at your pace. Genki: Recommended & used at most colleges/schools. A learner favorite. This has great ratings on Amazon. Alright, at this point, we’ve covered the majority of what you’ll need to learn at your pace. Would you need anything else? But what if you already have some book, learning program or app that you bought? Good. Then use that. Any start is a good start when you’re a beginner. Worrying about “starting perfect with the BEST THING” and digging through all the available resources will kill your learning. Too much choice is bad for you. It slows down decision making. It will slow down or stop your Japanese learning. If you already have some book, program or app, stick with it. See step 9 about “sticking” with things. Don’t worry about having the BEST possible program or start. Only people looking to fail do that. Step 2: What is your reason for learning Japanese? Now that you have the tools for studying Japanese by yourself, what’s next? Well, why are you learning Japanese? Some people want to live in Japan (strong motivator – needed for daily life). Others need it to speak with family (also very strong). Then there are people that are simply interested in culture, manga, anime and drama. And finally… those that do it just because they want to. Some of these reasons are strong motivators. Some are weak. Now, don’t worry. But, people with weak reasons can and do succeed. People with “strong” reasons fail quite often. They tend to forget why they’re learning, get bored and quit. You’ll learn exactly why people quit/fail in Step 2. To do now: Write down your reason. Or better yet, leave a comment down below! Keeping your reason in mind will motivate you to keep going. So now, you know how to stay motivated. Next step: How do you avoid quitting? Keep reading. Step 3: Remember, consistency is important. A lot of self-learners fail. They start learning, they buy a book, they stick with it for a week… and they begin to fall off. Why? Many reasons. They get bored. They don’t see progress. They get distracted. Excuse #4. Excuse #5. Whatever. These small reasons are not important. But the biggest reason they fail is that they don’t understand consistency. Now, I warn you. This part will sound like SELF-HELP preaching. And it is because… there is no one, not me, not the words on this page, no book, no app, no article that will help save you. Only you can help yourself. I can’t do it for you. If you truly want to succeed in Japanese, you need to brainwash yourself and understand that…. learning Japanese will take consistent time and consistent effort over a long period of time. Why do athletes practice consistently? It doesn’t take a day. It takes a long time to get good. Then you have to maintain skill. Why do bodybuilders spend most of their time in the gym? Same as athletes. Serious progress takes a long time. Why do people that eat burgers daily get really fat? Why are people that started programming at the age of 14 (and never stopped) so good now? They may not have realized it as kids, but because they kept at it, they became good. Why is your favorite singer so good at singing? They’ve been singing since they were 16 and never stopped! Time. Effort. Over a long period of time. Some understand consistency. Others were lucky to develop it without thinking about it. This is the case with those that start young. For example, when parents that force their kids to learn piano. The kids keep it at because that’s all they know and they can easily continue. They don’t have to think about consistency. They were raised on it. So, how do YOU become consistent? First, I’ll tell you a good story. Then, you’ll learn specific ways in Steps 3 and 5. So, the old Master wrote “Attention” on a chalkboard. “Is that it?” Asked the student. So, the old Master wrote “Attention” again. “But that’s not wise or profound. Give me something that will shake my mind” whined the student. Again, the old Master wrote “Attention” on a chalkboard. Attention. Attention. Attention. The student demanded “What does this Attention mean? ?” “Attention means attention” replied the master. Moral: In order to pay attention, you must pay practice paying attention. So, what’s the point of this story? It’s this. In order to be consistent, you must be… consistent. See, the student was looking for something “deeper” – that would shake his mind and stir his soul. Intellectual masturbation without any actual results. This is the mistake most learners make. Instead of practicing the damn thing, they go to read about the damn thing. Just like learning Japanese, same goes for acting classes, dancing classes, calligraphy classes, writing classes…. through physical practice, you develop the mental habits. Through the physical, you develop the mental. So, to be consistent, you must practice being consistent. You must make a habit of doing it every day or every 5 days out of the week. Step 4: When is the Best Time to Start Learning Japanese? Yesterday. Last year. Five years ago. And of course, right now. The next best time to start learning is today. Here’s why. Imagine that learning Japanese is like rolling a snowball. Look at routine #1. Day 1 You roll it and it gets a little bigger – 3 inches in diameter. You roll it and it gets a little bigger – 3 inches in diameter. It’s gone now. But you do gain something when you do skip it. You’re now rolling ANOTHER snowball. Instead of practicing Japanese learning and strengthening that habit, you’re now practicing LAZINESS and INCONSISTENCY and you’re getting better at ’em. Like muscles, when you skip your biceps, they will grow weak and what you focus on (doing nothing/being lazy) will get stronger. Note: This is also a good lesson in consistency. So, that’s why right now is the best time to start. You can make Japanese progress right now. Then, tomorrow. And if you keep that snowball rolling, the better you get. But, the more you put it off, the more you lose as shown by my sweet snowball example. If you don’t start now — starting things is a skill to be learned too — you likely never will. Step 5: How Much Japanese Should You Learn a Day? Okay, before you get excited, all “rah-rah” and try to spend the next 5 hours cramming, stop. Do not overwhelm yourself. If you have an app or a learning program, do NOT do all the lessons right now. Learners who steamroll through their first few days fail in the long run. just like in the gym, you start with 5 pound dumbbells, work your way up to 10, 15 and so on. So, a learn a little bit. Let’s get specific now. Step 6: Set A Small & Easy Goal Every Month. Another reason most learners fail — they aim for goals like “I want to be fluent.” Oh yeah? How soon? How will you get there? When they realize they set a goal that they don’t know if they’ll ever reach – because it’s so big and vague – they quit. Small & Easy – why? So you can easily achieve it. example: learn 100 Japanese words in 1 month. Measurable – why? You’ll know how much you have left to go. example: 100 words is measurable. Has a Deadline – why? You’ll know when to reach it by. Otherwise, you’ll be forever wading through the same learning materials and never making progress. example: if you set for 1 month, make the deadline the end of the month: December 31st. Doing this will guarantee that 1) your goal is a lot more realistic, 2) you’ll know how much progress you’ve actually made and 3) you’ll be inspired to aim a little higher – and make more progress. In other words, you’ll become consistent. Write down your small Japanese goal for the month. Write it down in the comments! Write down the words in your notebook every day. This is an easy way to drill some Japanese and keep your habit going. Step 8: What Next? Stay Focused & Finish. First of all, remember the first 3 steps and your success is guaranteed. Anyone can jump from one thing to the next. Very few finish it to the end. And those are the ones that tend to develop the learning habits to make good Japanese progress. If you find this helpful, do print it out and keep it by your desk. Steps 1, 2, 3 and 5 are particularly important that most learners never grasp.